Biesse America officially opened its West Coast showroom and service center April 25-26 in Anaheim, Calif. 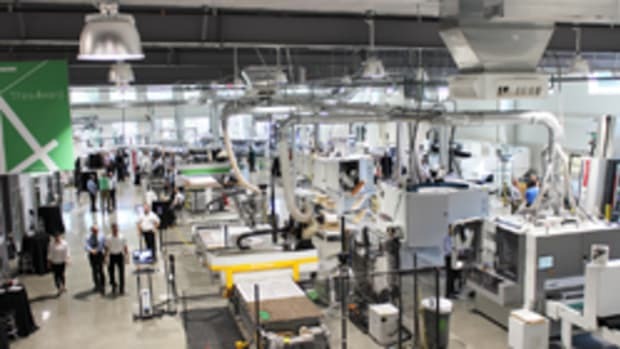 The event drew 75 attendees for machine demonstrations on a wide range of applications including nested-based cabinet manufacturing, machining of plastics and composites and the fabricating and milling of wood panels. In addition, several industry partners were on hand to discuss financing, software, dust collection and vacuum fixturing, according to the company. The showroom has multiple machines under power and ready for demonstration as well as industry experts on hand to answer questions. For information, contact marketing@biesseamerica.com. Precision Drive Systems, a provider of spindles sales and service for CNC routers, milling machines and robotic units, has opened a new West Coast branch in Arlington, Wash.